Ah zero days are here again. I arrived here in Etna early. July 27 is my thirty-first wedding anniversary. Thirty one years married to the mother of all my children. She's coming to see me. I'll be off the trail for a few days as we spend some well-earned time together. I wake up early which for me isn't early. Instead of eating breakfast in the dark I order some new shoes. I'll meet them in Ashland. I wonder how many pairs of shoes get shipped to Ashland for PCT hikers each year. Every Thru-hiker I spoke with said they were getting new shoes in Ashland. My old ones certainly are reaching end of life. The midsoles are starting to feel thin and I'm feeling the rocks in the trail a lot more. I probably should have replaced my Cascadias sooner than eight hundred eleven miles. Trying to learn from my mistakes my Wildcats will be replaced by new Wildcats in Ashland. After ordering shoes I hop on a loaner bike and go to get coffee and breakfast. The locally run donut shop was behind on their donuts so I had to settle for a Mocha. Then over to Bob’s for a breakfast you can believe in. The Country Breakfast includes three eggs, two bacon, two sausages, hash browns, and two pancakes. Fabulous pancakes, memorable pancakes, pancakes I'll dream about when I'm back on the trail. Back to the Alderbrook Manor where I get my resupply box off the porch and settle into my tent for a game of food match. Dinner stuff with dinner stuff, snacks with snacks, etc. With my food sorted, I pack my pack and head to town to catch the bus to my undisclosed anniversary reunion location. Kelli's headed there too. Waiting for the bus I buy an iced vanilla latte. I sit on the curb where I was told the bus stops and wait. I watch life in this cool town go by. Locals stopping in at Ray's Food Place. Etna’s a friendly place. Even to Thru-hikers. More than half the people driving by smile and wave at me. 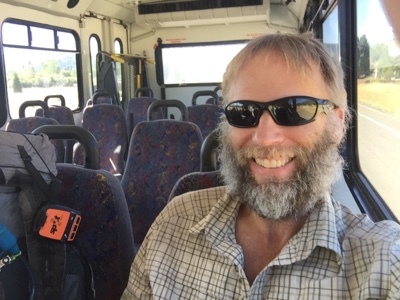 The bus comes and a climb aboard and out of my PCT thru-hiker role and blog. I'll be back in a few days.